Try as I might, my better half here at FDJ, doesn’t really get on board unless the games are Disney related. Recently though, we had a breakthrough! Due to moving into our first home and having many friends with young children, we’ve discovered Games Nights! No, not the film (although that is great if you need a film recommendation) but a gathering of our best friends to take part in online party games. Wayyyyy back when this would usually mean gathering around a tiny 14 inch TV playing 4 Player Goldeneye or if you really liked falling out with your friends, Mario Kart! 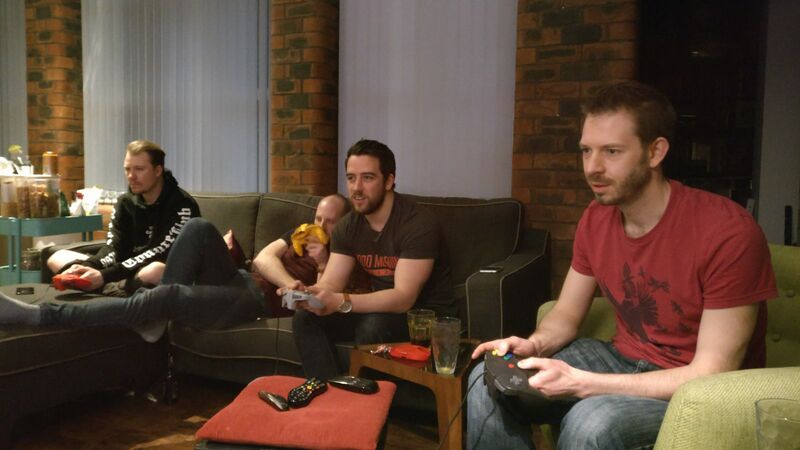 I love having a retro Nintendo night with friends as you can see from the photos. 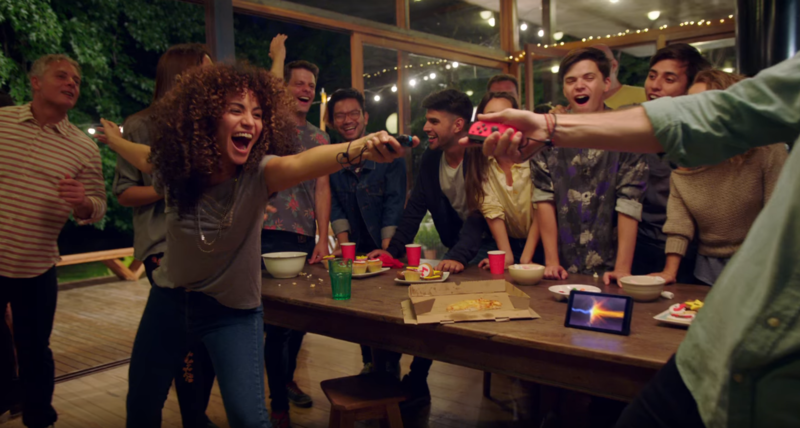 But it’s now 2019 and we no longer need to gather around the world’s smallest TV, we can stay at home playing on massive TVs and there is no better system for party games than the Nintendo Switch! I’m sure you have seen them by now as they have been out for a couple of years but they are basically a tablet screen with detachable controllers which can be customised to be as colourful as the Nintendo characters themselves. Everyone knows Mario with his bright red hat and moustache! Playing with friends online who also have a Switch can be great fun especially if you use voice chat for those friends who live further away such as Leigh’s friends who live in London whilst we are in Manchester. The Switch has the same type of motion controls as the Wii, so you can relive your memories of playing tennis and bowling by swinging your arms around. But remember NOT to hit the person next to you – unless you have a really competitive spirit which might happen if you win a race in Mario Kart 8 in the last seconds via a well timed Red Shell attack. You can also work together if competition isn’t in your nature. There is a full River Rapids game in Mario Party which is a combination of lots of mini games where you and your friends get to row – literally row – your boat between events where you can either be strutting down the catwalk or escorting penguins back to their mamma. Due to being a couple of years old now, there are some great deals out there which can include extra games such as the recommended Mario Party and Mario Kart packaged together with the console. Rather than just going to the High Street though, I would use a comparison site like www.latestdeals.co.uk/tags/nintendo. You can get the most up to dates deals by using a comparison site for both online AND in store which might save you a trip to the shops. It can be extremely frustrating to miss out on a great deal especially if you are spending over £200 even if it is excellent value. Once you have picked it up or had it delivered, you and your family and friends are ready to go! By making savings, you can use the extra cash for a number of accessories because the Switch is also portable unlike other games consoles available. You will certainly want a carry case and screen protector for on the bus or train. Often seen as a “kids” games consoles, Nintendo actually have made some of the best consoles and games for playing with your friends and as they catch up with their online networks, there are less reasons than ever for that 13 year old that played the original games not to still be playing with friends old and new today! So what are you waiting for? It’s time to NintenDO it!!! Enjoyed this slice of Mike? Be sure to catch up with all my FDJ Homme posts by clicking here! P.S. Want more FDJ LDN homme or indeed “fille” in your life? Well, why not subscribe to our mailing list? Just click the “Subscribe” button at the top right of the page and you’ll get all our latest posts as soon as they go live! You can also follow us on Bloglovin’ if you like. And be sure to check us out on social media! Follow us on Twitter, Instagram and Facebook. *This post is in collaboration with Latest Deals – all choices and opinions are our own as always though fillies.